This soup is so tasty – especially with tortilla chips and avocado. And healthy too – almost no fat! It’s no secret that when the monsoon rains hit in Costa Rica, there isn’t much reason to go outside unless you have to. It’s wet, too loud to watch tv, and windy. All of which equal the perfect conditions for sitting around the big family table and enjoying a hot bowl of soup. My husband’s favorite recipe is for garbanzo soup – a brothy, tomato-y hot concoction that is perfect for Costa Rican “winter.” I spent some time researching lots of tomato and chickpea (garbanzo) soup recipes when we were most recently in Costa Rica, and perfected this version – just in time for Fall! In a large stockpot, either cook the bacon and remove leaving the bacon grease for your sofrito, or heat the butter or olive oil. 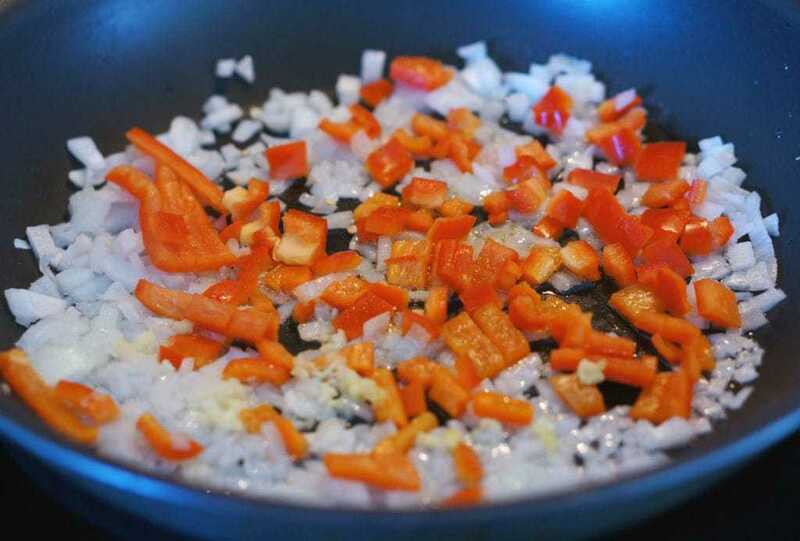 Add the red pepper, onion, and garlic and cook until softened. Add the chicken, one cup of broth, and the salt and bring to simmer. If you care using the bacon, you can cut it into small pieces and throw it in. In a blender, add the can of tomatoes, one cup of chicken broth, and the ketchup. Blend until smooth and add to the pan with the sofrito, chicken and bacon. Next you will add one can of undrained garbanzos and the optional carrots to the pot and stir. Bring back to a simmer. At this point, you can add drained garbanzos and chicken broth until you get the consistency of broth that you desire. For me, I like to have a lot of the chickpeas and a pretty brothy soup. Add salt to taste, and heat thoroughly. I usually add the cilantro about 5 minutes before serving, or you can garnish the soup with fresh cilantro on top. This soup is traditionally served in a deep bowl with white rice on the bottom and covered with soup. I like to forgo the rice and eat with tortilla chips and avocado slices. ¡Buen provecho! Cuando vienen las lluvias de invierno, no hay nada mejor que sentarse en la mesa de la casa para compartir una rica sopa de garbanzos con la familia. Después de probar miles de sopas, y intentar muchas recetas, he perfeccionado una sopa de garbanzos rica y saludable. En una olla grand,e o cocina la tocineta, dejando la grasa para el sofrito, o o calienta el aceite o la mantequilla. Agregue el chile dulce, cebolla y ajo, concinando hasta que estén suaves. Agregue el pollo, una taza de caldo y el sal, y cocinar hasta hervir. Si estás utilizando la tocineta, puedes cortarla en pedazos pequeñas y la agregues también. en la licuadora, combina la lata de tomate, una taza de caldo de pollo, y la salsa de tomate. Bate haste que se quede bien mezclado, y lo agregues a la olla con el sofrito, el pollo, y la tocineta. Ahora vas a agregar una lata de garbanzos, con el líquido, y las zanahorias a la olla, y lo mezclas hasta combinar. Vuelve a hervirlo. Ahora puedes agregar la cantidad de garbanzos, caldo de pollo y sal hasta que se quede la sopa a tu gusto. Yo agrego el culantro unos 5 minutos antes de servir. La sopa se sirve tradicionalmente en una tza honda con arroz blanco al fondo y la sopa encima. O agregue tortillas fritas en vez del arroz. ¡Buen provecho!